Sudeep is a mobile app development aficionado with expertise in strategic planning, product innovation and mobile applications. He has been an effective leader being hands on technically; equipped with superior decision-making and problem-solving techniques, along with the ability to interface with management, clients and people of diverse socio-cultural background. He has a bachelor of technology in computer science and started his career as a software engineer. 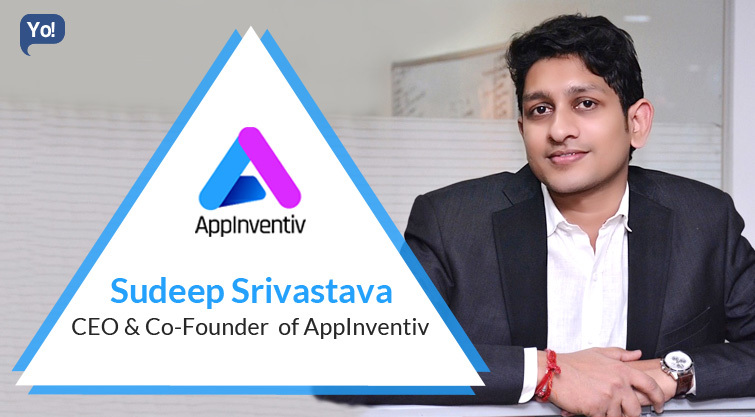 His latest venture AppInventiv is one of the fastest growing mobile application development company in India. They have a perfect blend of understanding of the mobile technology, well complimented by rich experience across all the major enterprise verticals including wearable technology, augmented reality, enterprise mobility and social networking. I realized that many businesses, small or big, had wonderful ideas but were struggling to imbibe mobile technology in enhancing their business’s value and revenue by leveraging next gen technologies. This was an inspiration to be in business – to help those businesses and individuals. And, that’s why we wanted to make it easy for businesses and individuals to reach out for such technologies. Moreover, this provides my team and me a humungous opportunity that can bring to the world creativity and innovation on one hand and security, good coding on the other hand to the world. The biggest challenge, although exciting too, was to build a team of industry experts and align them together towards a common goal. We started with a team of 10 people and now we are a team of 140+ professionals and experts. Each of the team members is adept in his/her respective areas and has a common goal of making world-class applications. Each day is a new day for me that come up with loads of opportunities to innovate, make our clients successful and my team to grow. AppInventiv is solely a self-funded and, yes, a profitable company. The key to overcome such challenges is to align the team members with the company’s vision and mission. Besides, we always focus on hiring passionate people who have high energy and hunger to learn and try out new things so that this reflects in the way we handle our projects, which in turn, makes our clients successful. We have two key missions of our company and each individual here contributes to stand up to that mission – to ensure high Client Satisfaction and high Employee Satisfaction. This is something we internalize in every aspect of the work we produce. Every individual contributes to bring a unique work culture, creativity and innovation. Since inception, while focusing on employee engagement, we have been putting in efforts to keep employees motivated, We go for company trips, organize sessions from industry expert etc. which help them learn and grow in their career. By being a leader rather than a boss. Having an urge to take risks and creating an environment of positive energy, passionand creativity. We developed Gullak and it has more than a million downloads now. ‘Planning everything yesterday’. This enables me re-vitalize me and my team efficiently, meet project deadlines, adverse risks and avoid last minute hassle. Strive for excellence for everything at hand – be it motivating the team, hiring people, choosing a project, delivery a project or meeting customer implicit needs. Everyone makes mistakes. But, one should learn from them and should never repeat them. A motivated team aligned towards a common goal can do wonders. In our short journey, we have very well understood that you or your company is as good as the team and can grow, only if people grow with you. To build one of the biggest teams that comprises of passionate and vibrant people, who believes and internalizes innovation by leveraging latest technologies to ensure delivering world-class mobile solutions for our clients. Besides, we are working on the blueprint of our R&D lab and I am looking forward to making it one of the best and advanced in the near future. Any place which is calm and beautiful. While we are a young bunch of passionate people, I wish I could have started 5 years earlier. The most inspiring quote that I cherish is – ‘Innovation Distinguishes between a Leader and a Follower’ by Steve Jobs.